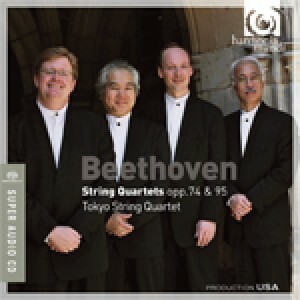 The Tokyo String Quartet continues its complete Beethoven cycle with this third volume, already designated one of Billboard's Top 20 Classical Albums. Both the graceful op. 74 (nicknamed 'Harp" for its use of pizzicato) and op. 95, with its quest for the essential, testify to the new maturity achieved by the composer around 1810. "Although perfection is usually unattainable, I can't recall any performances of these works that are so suggestive of the word...The execution is virtuosic..."
"one of the most illuminating I've heard… the Tokyo produces a clean, incisive sound that clarifies the part-writing… a sharply etched, white diamond-like quality… a lofty serenity that moved me deeply."